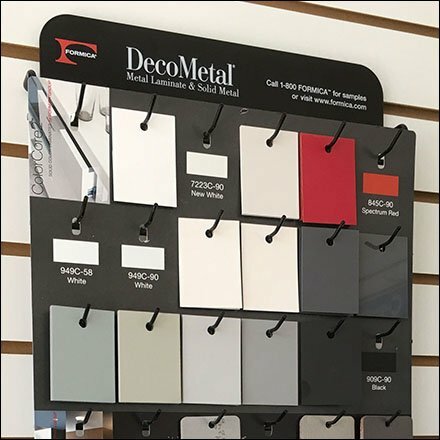 These Formica DecoMetal Samples Slatwall Standoffs implied a Slatwall Mount. But closer inspection revealed threaded fasteners for permanent attachment. Still mission accomplished with easy-access Hooked display of color snd finish. Consider in closeups and the Formica DecoMetal Samples Slatwall Standoffs gallery of images. Seen at Rugby Architectural Building Products, Moonachie, NJ.